Home / Flying Squirrels / FS3 – Climb Squirrel Climb! 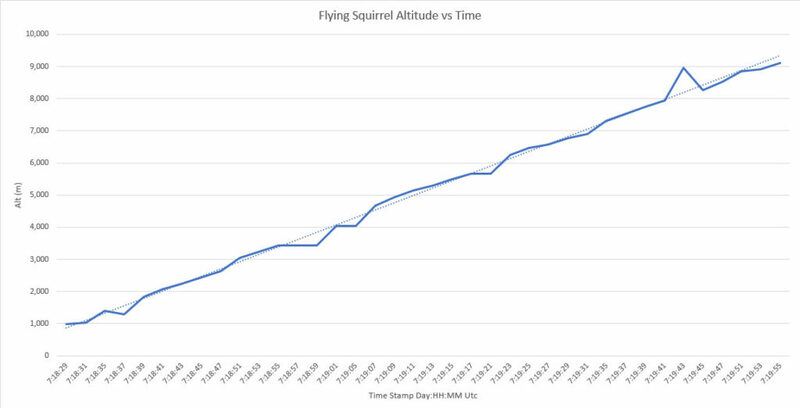 The graph above shows the ascent of FS3 into the sky, until the telemetry signal was lost. Our daring squirrel was a good climber! Each time stamp (Day:Hour:Min) is 2 mins apart. (Except for few missing data points). FS3 reach a last known altitude of 9,100 meters. (29,855 ft). If the balloon did not burst at the last know spot, it clearly could have gone much higher. The big bump near the upper end of the graph line, was most likely caused by a GPS mis-reading. Two stations copied that telemetry data point the same, so that was the data sent, but it looks out of place. The dotted trend line is probably closer to the truth.